An effective resignation letter is one that exactly outlines the reason for quitting the job in a positive way and puts a positive impression on the mind of the reader. There are two core points of the resignation letter. The first one is the fact that you are leaving and the second one is the exact date of leaving. Mentioning both these points in the resignation letter makes it totally professional. A transportation manager performs all the tasks related to handling the transport of the organization. The main job roles that are assigned to a transportation manager are managing the transport, keeping track of vehicles and transport routes, coordinating and negotiating with customers. 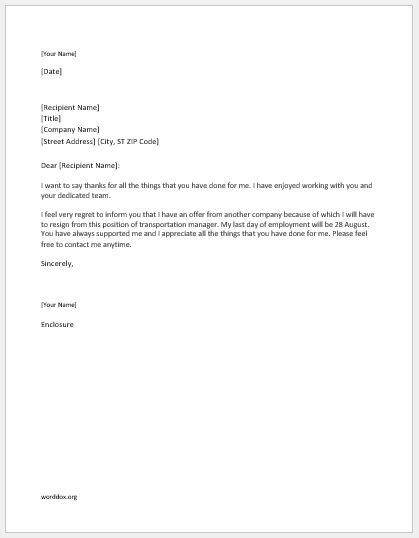 The transportation manager resignation letter is written when you want to resign from the position of transportation manager and wants the employer to know about your decision as well as the date of leaving. First of all, make sure that your resignation letter is upfront and it is clearly stating that you want to leave. There is no point of getting confused when you have decided to quit. Be crystal clear and announce that you are going to quit. Briefly, include the details about your job such as your position and the number of years or months you have been working here. Make sure that your resignation is not more than one page. Sample transportation manager resignation letter is given here to let you help in writing one for yourself. I want to say thanks for all the things that you have done for me. I have enjoyed working with you and your dedicated team. I feel very regret to inform you that I have an offer from another company because of which I will have to resign from this position of transportation manager. My last day of employment will be 28 August. You have always supported me and I appreciate all the things that you have done for me. Please feel free to contact me anytime.